Developed from the Comet airliner, the Nimrod has served as the Royal Air Force's maritime reconnaissance platform since 1969. Airfix's light gray plastic features recessed panel lines. Parts are provided to model MR.1, MR.2, MR.2P, and R.1P versions. The differences involve antennas, external equipment, and weapons, and are clearly indicated in the instructions. There are a few ejector-pin marks in inconvenient locations (such as the inside of the weapons bay doors), but there were minimal mold seams and no flash. The instructions include complex stenciling diagrams for each of the six options as well as a separate color painting guide. The large decal sheet provides every stencil on the aircraft, but, as I discovered, the decals are this wonderful kit's greatest foible. There is a dot pattern in the printing, especially noticeable in the roundels and nose art, and the decals are very thick. There is an extra clear coat over the entire sheet, so each marking must be trimmed closely to remove the excess. It's unfortunate, because the level of research that went into the markings is phenomenal. Six aircraft are depicted: a gray-and-white MR.1 from 1977; one hemp-and-gray MR.2; three MR.2Ps, one overall camouflage gray, the other two hemp and gray; and one two-tone gray R.1P. The flight deck's detail is sparse, but not easily seen through the windows. I assembled the interior and inserted the windows. The oval clear pieces will protrude if you push them all the way. Test-fitting indicated the windshield is too wide. I glued the rear fuselage together, shimmed the gap behind the windshield opening with a short piece of .060" styrene strip, then glued the rest of the fuselage together, filling the remaining gap behind the cockpit with styrene and putty. This eliminated sanding the clear part. I glued the intake trunks together using Mr. Surfacer 500 to smooth out the worst of the seam. The two upper wing parts fit well to the one-piece lower wing, which incorporates a good portion of the aircraft's belly. I attached the wing using tape to ensure the wing roots fit without a gap. Perhaps due to the large open weapons bay, the wings dried with a lot of dihedral; the full-size Nimrod had almost none. To fix it, I held the wings at the correct angle, then glued three pieces of sprue across the weapons bay, trying to pick areas that wouldn't impede fitting the weapons. The bay itself is lacking detail; there should be racks. The instructions don't mention the searchlight that goes inside the clear dome (part No. 8F) on the starboard wing - but it is included among the clear parts. The horizontal stabilizers needed a bit of filler, but locator tabs set the dihedral. After adding masks from Eduard (No. CX212), I painted the aircraft hemp and gray with Gunze Sangyo acrylics. I chose to model Maid of Moray, an MR.2P used in Operation Telic. It features colorful nose art and low-viz markings. Decaling took forever, but it looks good when it's done. Next time, I'll use aftermarket decals. 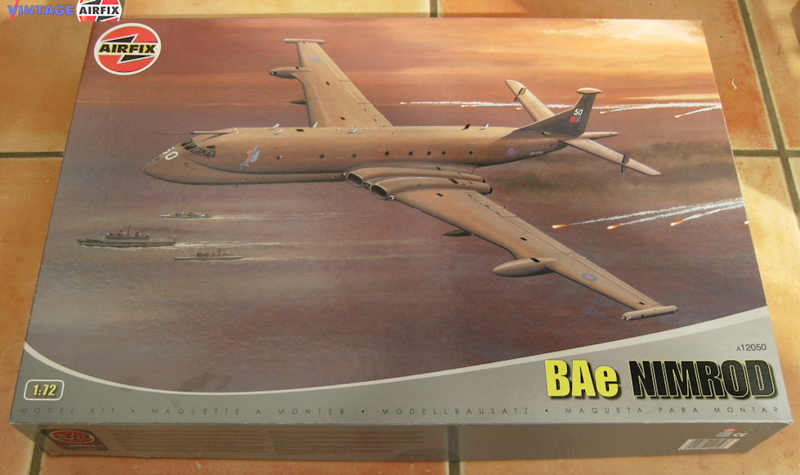 It's a big model - more than 20" long - that matches dimensions in The Encyclopedia of World Military Aircraft (edited by David Donald and Jon Lake, published by AIRTime), and captures the Nimrod's awkward grace well. Although I spent about 35 hours on the model (at least 15 on the decals) I had a lot of fun building it; the minor challenges provided good modeling practice, and the finished model is imposing. Now I just need a place to put it.